Aluminum filter element for air conditioning system Lancia Delta e. 2. Submitted by a Lancia Delta HPE of construction year 1996 with 1.6 16V petrol e..
Used antenna base for Lancia Delta II all types including HPE. There are several antennas have been mounted on the Delta, so check carefully this ante..
Ashtray with cover and shell for Lancia Delta type 2 (built from 1993 to 2000) for mounting in center console. The unit is complete with 12 volt cigar..
Used city light for mounting next to headlight for Lancia Delta HPE all models, including the type II. Is an original plastic unit from Lancia. These ..
Side light unit used for Lancia Delta II for mounting next to the headlight. The unit is of the valeo brand and with a lancia logo in the ' glass ' (t..
Used sensor for cooling water temperature. Submitted by a Delta II of construction year 1999 with a 1.6 16V petrol engine.2 hole connector.OEM lancia ..
Used sensor for cooling water temperature for Lancia Delta II. 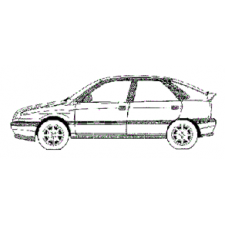 Submitted by a Delta LE of construction year 1999 with a 1.6 16V petrol engine.OEM Lanc.. Submitted by a Lancia Delta HPE type 2 1.6 16V year built 1996. It is a three-pin sensor also called switch for the fan. opschift on the collar of the..
Used gear knob and poker cover in black finish for Lancia Delta II. This unit comes from a LS implementation 5-DeltaII, but in principle applicable to..
Used original flasher unit for Lancia Delta of the second type, year of 1993 to 2000. There are different versions of these..
Two correctly working ignition coils in the original holder for mounting on the intake manifold for Lancia Delta II HF with 2.0 16V Lampredi engine. T..